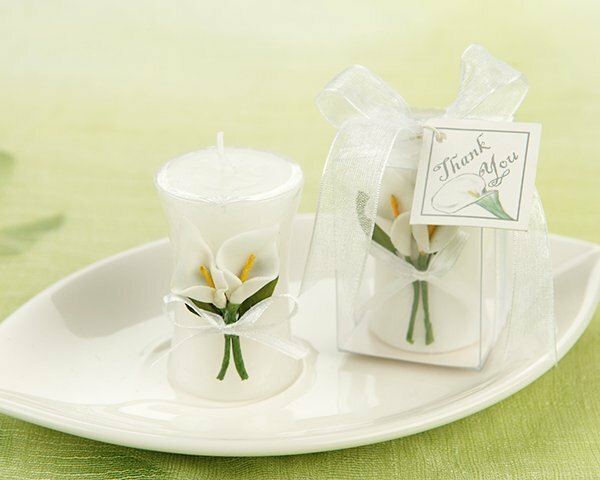 One of our most popular calla lily wedding favors! Sleek and sophisticated are apt words to describe these little beauties. A slight hourglass shape gives the candle a distinctive profile, and the hand rolled fabric lily is attached with miniature silken ribbon, presenting a tiny and perfect bouquet. The candle arrives in a transparent gift box, allowing your candle to shine from all angles. 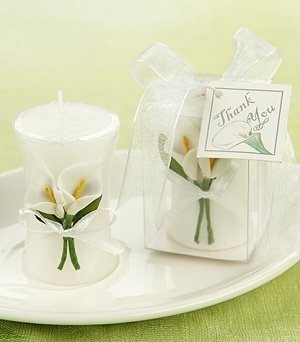 Box is tied with a sheer white ribbon and attached Calla-themed "Thank You" tag. Box measures approximately 1.75" W by 2.5" H.